Jane UK antwortet: Hi Matt, the fitting list is available to download from our GRAVITY PAGE on our website, scroll down the page further. It is a downloadable PDF file with the current list, of which your car is on and confirms the Gravity fits ok. Hope this helps. Jane UK antwortet: The 2003 VW Golf Hatchback is on the pre-tested list of cars and the Gravity will fit fine. 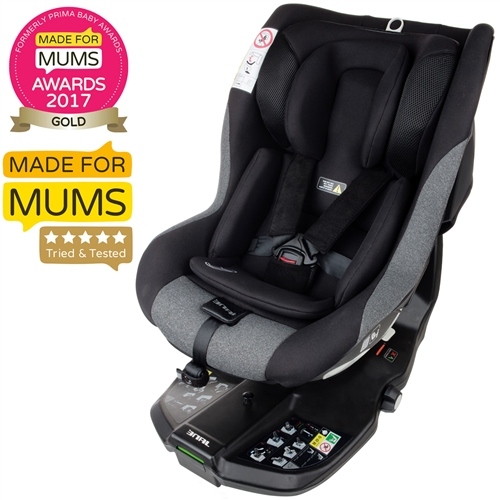 Jane UK antwortet: Hi Lizzie, sorry but no, as the car seat swivels the base is built into the whole system to maximise its strength. It usually only infant car seats which have carry handles that have a separate base so they can be removed to be used outside the car on a chassis as a travel system. Bigger seats, the child would be too heavy and therefor car seats for older children tend to stay in the car. Jane UK antwortet: Yes your car has been tested with the Gravity iSize car seat and fits perfectly well. In fact the Gravity will fit all modern cars that have ISOFIX and the only things to check for, as with all car seats, is that any AIRBAGS are switched off on that seat position, and that the floor in which the support leg is placed onto is solid; no underfloor compartments. If it does have a compartment, then you need to speak to your car dealer for a filler, or check that the support leg can extend to the solid floor of the compartment. Jane UK antwortet: Unfortunately Jané have not got round to physically trying the Gravity in your model of vehicle yet. However the Gravity will fit all modern cars that have ISOFIX and the only things to check for, as with all car seats, is that any AIRBAGS are switched off on that seat position, and that the floor in which the support leg is placed onto is solid; no underfloor compartments. If it does have a compartment, then you need to speak to your car dealer for a filler, or check that the support leg can extend to the solid floor of the compartment.